The SD83x Power Supply Units are designed to meet all the applicable electrical safety data stated by the EN 50178 harmonized European Standard Publication and the additional safety and function data required by EN 61131-2 and UL 508. The secondary output circuitry is accepted for SELV or PELV applications. They are switch-mode Power Supply Units which convert the mains voltage to 24 volts d.c. 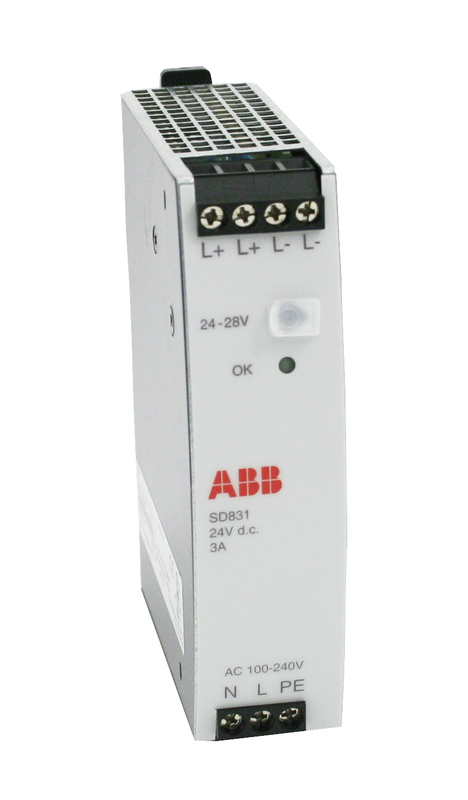 These power supplies can be utilized for non-redundant and redundant applications. Redundant applications require diode voting units SS823 or SS832. With the type SD83x series Power Supply Units, there is no requirement for the installation of a mains filter. They provide a soft start feature; power-on of an SD83x will not trip fuses or earth-fault circuit breakers. Mains/input voltage, nominal 100-240 V a.c. 110-300 V d.c.
Mains voltage variation allowed 90-264 V a.c. 88-375 V d.c.
Mains frequency 264-300 V a.c.